Diabetic fasting sugar 140 - is it high or normal? Diabetic fasting sugar high 130 - 140; post-lunch = 140 - 148 normal. Why? QUESTION: My fasting sugar level is between 130 to 140 normally and post lunch sugar is normally between 140 to 148.
pls advise why my fasting sugar is high and post lunch is around normal level? 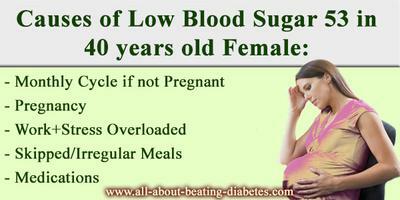 You have to know that sometimes the elevated blood glucose level, especially in the morning, is something normal. While you are asleep, your metabolic processes are running with very low speed. However, when you have to wake up, the metabolic process in your organism have to start running faster. The only way your organism can increase the speed of those metabolic processes is with the help of hormones. However, these processes are requiring energy, which is provided by the glucose. Therefore, your hormones elevate your blood glucose concentration a little bit. 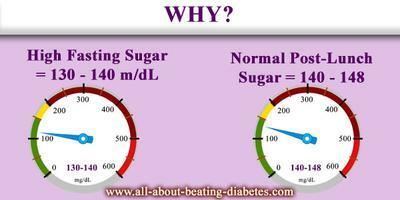 This can be possible explanation of your high fasting blood glucose concentration. Anyways, there is another option related with your dinner. For example, if your dinner is rich in sugars and fats, your body will need more time to metabolize the food. This, along with the low speed of the metabolic processes in your organism during the night, can lead to elevated blood glucose concentration in the morning. There is a third possible explanation, which is an inappropriate treatment for those patients taking diabetic drugs. If this is the case, my advice for you is to consult with your doctor about the adjustments in the treatment and to start following a strict diet, limited in carbs, especially during dinner. You can also start doing exercises, for example, running for about 30 min in the evening, will help you to reduce your morning blood glucose level. My fasting sugar lever is 52. What are precations to be taken is it normal or high? As I am feeling very very uneasy like slight dizziness,feel very weak, cannot concentrate,feel heady is heavy and very unconfortable and not feeling normal. What I have to do? Please advise!!!! - If you are a female of 40+ years old, and you are having your cycle; then, this can explain your situation. Next, if you are a pregnant woman, your low fasting blood sugar (FBS) is quite normal; however, you should adjust your dinner menu in order to avoid such low levels. - On contrary, if you are male of 40+ years old, then, your health condition could be explained by your actual physical and psychological work. If you are over-working, or have an overload in stress; plus, you are not having regular or healthy meals; this could explain why your fasting blood sugaris as low as 52 mg/dl. You can have regular meals; with more cereals to increase the energy needs for your body (especially, when taken at bedtime). - There exist many other diseases and conditions that are related to low fasting blood sugar, particularly connected with pancreas and liver metabolism. Therefore, you must talk to your doctor for further examinations to come out with the right diagnosis. you can take something at bedtime (just before going to bed), e.g. some snacks like cereals or fruits not to let blood glucose go at bottom. if you are taking any medications to lower blood glucose, talk with your doctor to change the dosage; therefore, you will not wake up with such LBS or feel weak all the time. 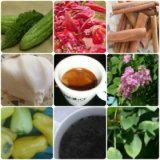 - I do not know if you are suffering from any other condition or disease, or, whether you are taking any medications for that particular disease; if this is the case, you can talk to your doctor if the disease or medications you are taking can interfere in the glucose metabolism and causing the problems you have. At the end, you can always talk to your personal doctor about any of the above-mentioned concerns, and hope that will resolve your problems.